These are the first, focused high-energy X-ray views of the area surrounding the supermassive black hole, called Sagittarius A*, at the center of our galaxy. The images were taken by NASA's black-hole hunter, the Nuclear Spectroscopic Telescope Array, or NuSTAR. Different X-ray energies have been assigned colors to make the composite images shown here. While Sagittarius A*, or Sgr A* for short, is huge -- about 4 million times the mass of our sun -- it's actually smaller than typical black holes situated at the centers of galaxies. Sgr A* is also a lot quieter than other supermassive black holes, only nibbling on fuel, such as stars, gas clouds, comets or asteroids -- or not eating at all. The black hole's eating habits are still largely a mystery, which NuSTAR's new views will help address. 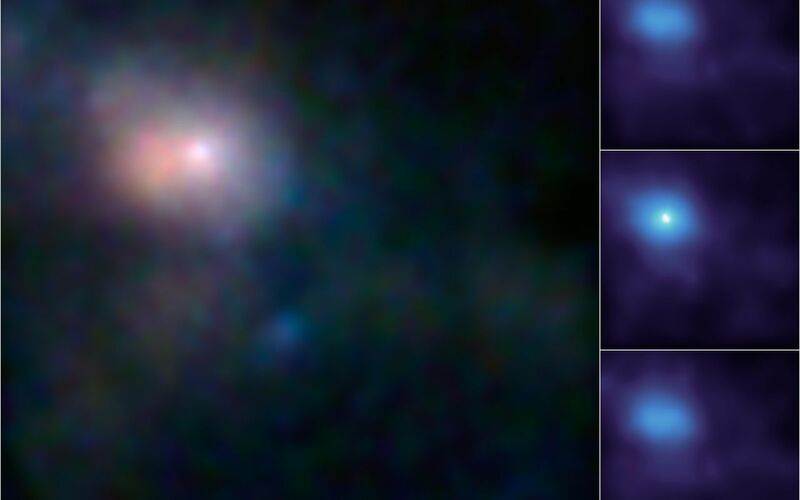 In the main image, the brightest white dot is the hottest material located closest to the black hole, and the surrounding pinkish blob is hot gas, likely belonging to a nearby supernova remnant. 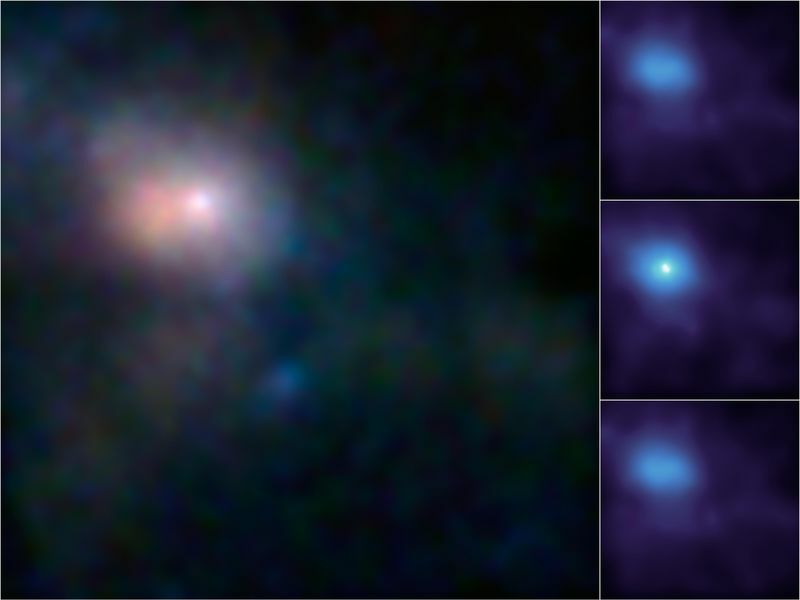 The time series at right shows a flare caught by NuSTAR over an observing period of two days in July; the middle panel shows the peak of the flare, when the black hole was consuming and heating matter to temperatures up to 180 million degrees Fahrenheit (100 million degrees Celsius). The main image is composed of light seen at four different X-ray energies. Blue light represents energies of 10 to 30 kiloelectron volts (keV); green is 7 to 10 keV; and red is 3 to 7 keV. The time series shows light with energies of 3 to 30 keV.